2005; 338 pages. Genre : Witty gritty bang bang. Overall Rating : C+. This is the second in Konrath's Jacqueline 'Jack' Daniels; series. A pair of detached arms show up at the county morgue. In handcuffs. More exactly, in a pair of Jack Daniels' handcuffs. Jack and her Viagra-popping partner search for clues to the victim's identity, and try to keep the latest Chicago serial killer's body-count from going too high. Meanwhile, Jack's mom decides to move in with her, and brings along Jack's ex- for company, which not surprisingly leaves her current beau a bit less than enthralled. This is similar to James Patterson's Alex Cross detective series, but with more wit and snappy dialogue. There's lots of action, and gratuitous gore. Great literature, it ain't. But it's a quick read and keeps your attention. Wikipedia calls this sort of book an airport novel. While the storyline is typical murder-thriller stuff, you at least get to see how Konrath, a male author, handles his female protagonist and her soap-opera-ish life. If there's a downside, it's the story's believability. It turns out that Mr. Psycho-killer's been dismembering folks for many years, and getting away with it just fine. Why then does he suddenly feel compelled to leave body parts at the morgue, with purloined police equipment planted on them? Later on, after wiping out half of Chicago's police force, instead of making an easy getaway, he (you guessed it) heads straight for Jack Daniels' home for the epic confrontation. Yeah, that's smart. 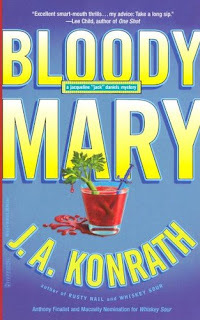 Read Bloody Mary for its entertainment value only. There's at least five mixed-drink-titled books in this series, and I'll probably end up reading most of them. It's appparent that they all are going to have a standard serial-slayer plot, with Jack's personal life progressing a bit from one book to the next. I suppose that isn't a very ambitious goal, but Konrath is good at it, and hey, that same template is used by the scriptwriters of Cold Case, one of my favorite TV shows. Airport novels. My worst fear in writing. Did you like the first one better? they're about equal. i have #3 and #4 on my TBR shelf. my fear is that i'll get to the end of them and conclude "if you've read one Jack Daniels book, you've read 'em all". I like mystery thrillers with strong female leads. There are alot of them out there. Some good, some not. It sounds like you recommend this one. Ever read any Janet Evanovich? I'm wondering if Jack Daniels is similar to Stephanie Plum. i've never read anything by Evanovich, but i'm going to the library this weekend. do you have a particular book by her to recommend? Konrath built Daniels as a strong character. and he takes the time to give details of her life - the clothes she picks out to wear, her conflicted feelings about her ex- and her current BF, etc. it would be interesting to see if female readers can connect with her, or if this is just Konrath vainly trying to get in touch with his feminine side. Evanovich's Stephanie Plum novels are her most popular. The first 6 or so, are the best. Very witty, funny novels about a New Jersey bounty hunter, her love life, her crazy family, all rolled into one major mystery to solve in each book. One for the Money - is the first in the series, but let me warn you, lot's of fluff here. These books are an entertaining, quick read only, but they'd still be fun to review. As for me, I think I will try on this Jack Daniels girl.